Lowest international fares, flights from USA to Europe, world's best travel agents, low-cost airlines, internet-only fares, travel auctions, travel insurance, lowest fares, online regular airfares, cruises, hotels, cars, maps, distances, & weather. On-line ticket office, agencies, special offers, Italy train timetable, stations, trains & ships, hot news; form to fill out departure station, arrival station, date and times. Hotel directories in Europe, luxury hotels & special offers, Italy destinations, luxury hotels in Europe, award winning accommodations, destination guides, great journeys around the world and hotel directories for weddings and honeymoons. An association in Rome designed to assist visitors to the Eternal City for business or holidays. Free Hotel Reservation and Apartments Rental. Airport Door to Door Service. guide to accommodations for rent or for sale in Rome and throughout Italy, long or short-term, holidays, offices and shops; job and business opportunities. weather, currency converter, travel booking, this month's listings, entertainment and nightlife. 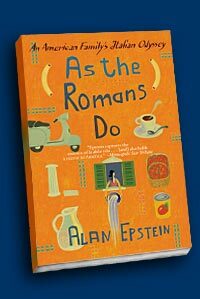 neighborhood & location scouting, walking tour, customized tours for newcomers with the author of "As the Romans Do", Alan Epstein. Bernini, Boromini, Micheangelo, Rafaello & Caravaggio.